After breakfast, I spent ten minutes basting my new belt. It is an elastic, “one-size-fits-all” belt that kept sliding down to my hips. I’ll wear it today and decide if I took it in enough, or if I should let it out a bit, and then I will make the permanent alteration. I was under the impression that “one-size-fits-all” applied to blogs, also. I read on Pinterest to publish your post between 1:00 and 4:00 pm to increase your traffic. Chris Snider, who teaches multimedia journalism at Drake University in Des Moines, recommended 9:00 pm in his article, “Get Facebook to show brand’s content” in the Des Moines Sunday Register on August 3rd. I dutifully published Tuesday’s post at 9:00 pm. I felt bad because I saw people checking the blog throughout the day. I normally publish at 10:00 am. One size did not fit all, and I was unable to be on Facebook at that time to respond to comments there. I am on Facebook at different times, my favorite being between 4:00 and 6:00 am. There are not many people on at that time. I try to touch base when I eat lunch and the 10:00 am publishing time works best for me. We need to remember…it’s our belt…and we are the ones who are going to be wearing it. I cleaned out the glove compartment in the van and found my old phone. We left it in there because I could dial 911 on it in an emergency. In the meantime, my husband upgraded his phone and put his old one in the van. I sent my old phone to cellphonesforsoldiers.com. I still had a few mailing bags in my filing cabinet. 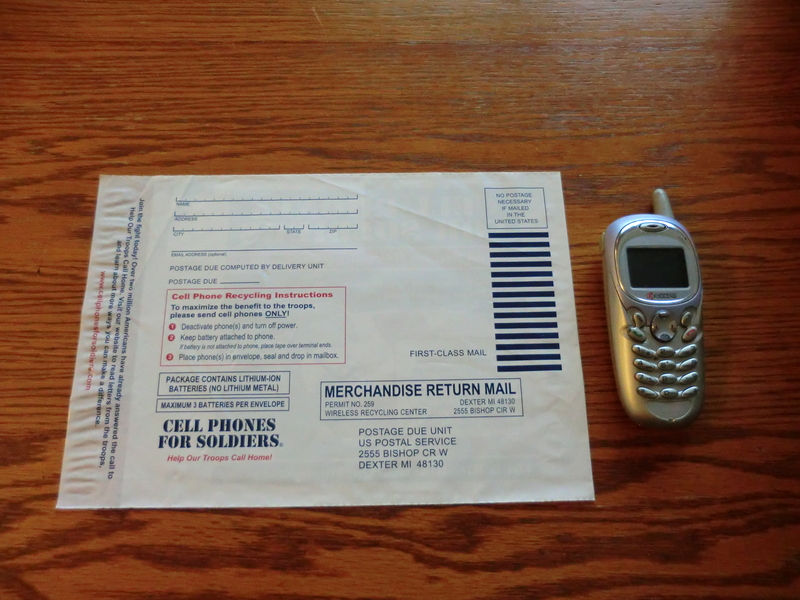 If you have a cell phone to recycle, you can get a prepaid printed label at this site. Every financial decision you make should be as personalized as choosing your cell phone. Donating my old cell phone. This entry was posted in Important Things, Purchasing, Use What You Have and tagged Important Things, Money Saving Ideas, Use What You Have by Frugal Fish. Bookmark the permalink.